What Chemistry Equipment is Available? For research of all kinds, Juniata's resources are among the best in the nation for a liberal arts college. Chemistry occupies one floor of the 88,230 square foot William J. von Liebig Center for Science. 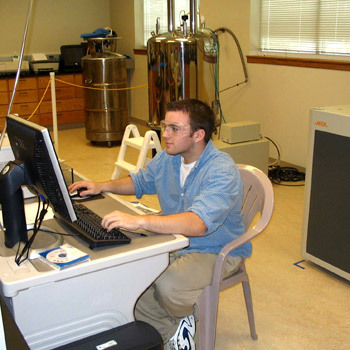 Juniata provides students with access to state of the art scientific equipment, enabling them to conduct high quality research at the undergraduate level. Henry Massman Professor of Civil and Environmental Engineering and Earth Sciences and Concurrent Professor of Chemistry and Biochemistry at the University of Notre Dame. Dr. Burns donated a SMART Apex I X-ray system which is a single crystal diffractometer. X-ray diffractometers are not common instruments at predominantly undergraduate institutions. Therefore, we are very excited that Juniata students will have opportunity to become not only familiar but also trained in this technique, which is gaining more popularity not only in research institutions but also in industry. The timing of this gift is impeccable, as we celebrate 100 years since the Nobel Prize was awarded to Max von Laue and William and Lawrence Bragg for their work in developing crystallography (For more information please see Nature or Science). X-ray crystallography enables us to “see” three-dimensional structure of matter at the atomic level, something we cannot achieve with any optical or even electron microscope. It is one of the very few direct analytical techniques that does not need any standards or calibration. X-ray crystallography is so powerful that it can determine the exact composition of any compound that can be obtained in its crystalline form without any prior knowledge about the compound. 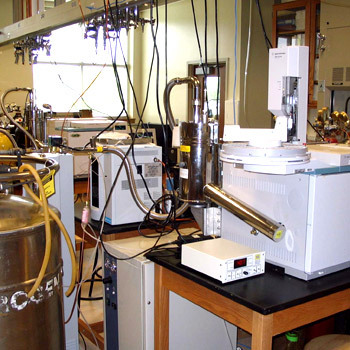 The X-ray diffractometer will be used in several chemistry classes and in undergraduate research. We are also open to possibilities in aiding nearby undergraduate institutions with access to X-ray crystallography. This could be accomplished via measuring their samples and possibly even offering a summer crystallographic class for undergraduate students. The instrument was installed in the middle of February and was fully operational at the end of March. In the meantime, we already were able to take advantage of having access to X-ray crystallography by identifying several compounds synthesized by students in Intermediate Inorganic Chemistry Laboratory and in the Chemical Synthesis classes. Four research students from Peter Baran’s laboratory enriched their poster presentations at the Dallas 2014 National ACS meeting by adding structures of their synthetic products which were measured literally few weeks before the meeting. The historically first crystal structure obtained at Juniata College was a compound synthesized and crystallized by Nick Morgan ‘14. Crystals of the CuCl2 complex with 3-hydroxyimidazole 1-oxide used for the measurement consist of two-dimensional inorganic polymeric layers (a fragment of one such layer is depicted on the attached figure) interconnected by hydrogen bonding from crystal water molecules making contacts with chlorine atoms and water molecules coordinated to Cu(II) centers. Nick Morgan will be forever remembered by the Chemistry Department at Juniata College as the author of the first crystallographically characterized compound within our department.